Diverse is the best way to describe the Red Sea. The Red Sea’s reefs epitomize diversity; they are home to more than 200 soft and hard corals. 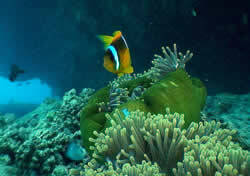 In fact, it has the highest diversity of coral reefs than any other section of the Indian Ocean. Coral reefs are formed by calcium carbonate produced by tiny coral polyps that populate tropical climates. The Red Sea provides the perfect resource from which reefs are able to grow – warm, salt water. 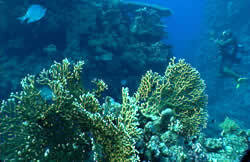 Reefs act as the primary source of food and shelter for fish and invertebrates. They have a significant impact on the environment by also protecting the shoreline from erosion. And just as a reef influences the environment and the life around it, its own life is directly dependent upon human activities, which can range from construction along the coast-line to changes in water levels. If these behaviors are present, a coral reef will easily be damaged. The sustainability of the Red Sea’s reefs is vital to all of the sea’s inhabitants.